Photo: Karen Pittman (foreground) and Namir Smallwood (background). Live From Lincoln Center is proud to present Lincoln Center Theater’s critically acclaimed staging of Dominique Morisseau's Pipeline on Friday, February 8, 2019 at 9 p.m. on WXXI-TV. 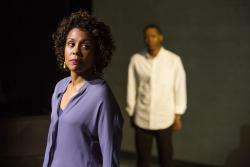 In this riveting production, Nya Joseph (Karen Pittman) is a dedicated, inner-city public high school teacher who is committed to her students’ achievement, while she sends her only son, Omari (Namir Smallwood), to a private boarding school. When Omari is involved in a controversial incident which threatens him with expulsion from his school, Nya is forced to reconcile Omari’s rage, her own parental decisions, and the public and private school systems, as she rallies to save her son.